Los Angeles is a new city, relatively speaking...I try to capture the soul of the City..the old buildings..the historical areas...the beauty. Arpad Domjan. Jozsef Cardinal Mindszenty Square, MacArthur Park. 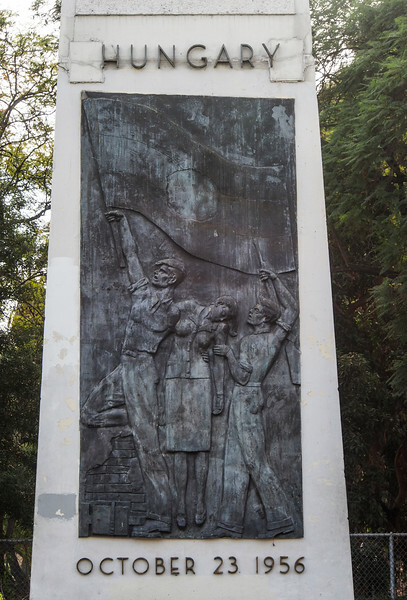 Erected in memory of the heroes of the glorious Hungarian Freedom Fight of 1956/A symbol of man's earning for freedom everywhere/Hungarian Freedom Fighters Federation 1969. This monument was blessed on June 14th 1974 by His Eminence Joseph Cardinal Mindszenty Prince Primate of Hungary. He fought all his life - always near to martyrdom - for freedom and justice for all nations of this earth./The grateful Hungarians 1976.